You can be the grandparent that every child wants! With Grandloving’s heartfelt ideas you’ll connect, bond, and grow closer to your grandchildren. This site and our book feature hundreds of tips and projects for you to use with your family, whether they live around the corner or across the globe. Enjoy your stay, and come back often – we have fun ideas for all ages and every season! When you order the fully revised and expanded edition of Grandloving: Making Memories With Your Grandchildren, you'll get tips from families worldwide. Grandloving also features hundreds of engaging, low-cost activities to do together or send in the mail. 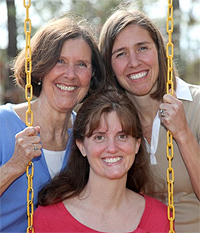 Grandloving is family-written by Grandma Sue Johnson, her daughter-in-law, Julie Carlson, and daughter Elizabeth Bower. > Site Tip: The first tab below is already open — click on any tab to open or close it. The 5th edition of Grandloving: Making Memories With Your Grandchildren includes anecdotes and hints from hundreds of grandparents, parents, and grandchildren from all over the world. Whether you’re a seasoned grandparent, newbie nana, or child caregiver, this vast collection of fun, low-cost activities, resources and helpful information provides support for family members of all ages! Fifth edition released April 2010 by Heartstrings Press, Lancaster, Virginia. To talk to Grandma, Sue Johnson, call 804-462-0884. >> To order, click on the tab below. Or, call friendly Grandma, Sue Johnson: 804-462-0884. You can even have your book signed to a grandparent friend or family member — just let her know how you would like the inscription to appear! Our Promise: We think you'll love Grandloving, but if you're not completely satisfied, just return the book in original condition within 10 days and we'll refund your purchase price. Jim Fay, co-founder of The Love and Logic Institute and author of Grandparenting with Love and Logic: Practical Solutions to Today’s Grandparenting Challenges. Chapter 2 — Hello, Baby! Experts, Grandparents, and Parents love Grandloving! 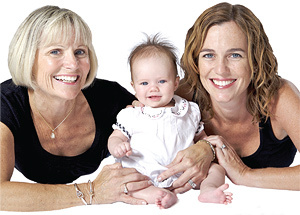 —Mary Jane Sterne and Peggy Edwards, authors of Intentional Grandparenting: A Contemporary Guide. —Willma Willis Gore, author of Long Distance Grandparenting. "As a loving grandfather and a cartoon creator who has never grown up, let me say Grandloving is a true treasury for every age! "Sue and Julie capture perfectly that special relationship between grandparents and grandchildren in this delightfully refreshing book that is a 'must read' for every grandparent and grandparent-to-be." —Richard Sherman, seminar speaker and author of Mr. Modem's Internet Guide for Seniors"
"Grandparents everywhere will have a ball with Grandloving! Only ten pages into the book and I was 'hooked.' This is a fun, down-to-earth collection of easy, inexpensive ways to show your grandchild how much you love them. This would make a great gift for grandparents — or buy one for yourself, Grandma!" 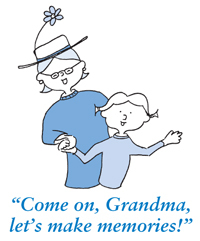 "A peppy, upbeat, easy-to-read sourcebook for making memories with your grandchildren." "The more we can do to express our love, the better off we all are. A delightful book filled with caring and thoughtful ways to strengthen family relationships." "Grandloving will get you through a weekend . . . it'll get you through a lifetime!" "Illustrated with how-to drawings, Grandloving also includes the most comprehensive resource section and index we've seen. We highly recommend it!" "What a fantastic collection of activities--it's a splendid book!" "Grandloving is a thoughtful treasure to give to new grandparents or even to those who have years of grandparenting under their belts. If you are already a grandparent, or are a grandparent-to-be, don't wait for someone to buy it for you; the book will be both a wonderful treat and a useful guidebook for you and your grandchildren." 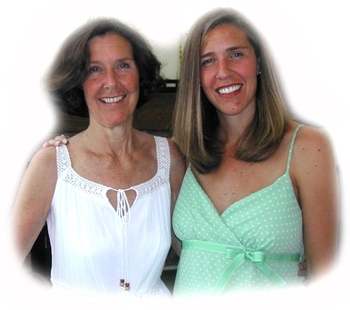 "I found Grandloving a treasure of tips and suggestions, and not only for grandparents! Aunts, uncles, friends, teachers, childless former college roommates — all of us who want to connect with kids need its help! The authors are gentle, humorous instructors — with this book's advice we are truly ready for 'Funlove' between grownups and children." 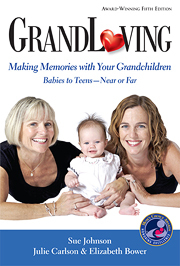 The 5th edition of Grandloving has received an Honors award: National Association Parenting Publications of America - Honors NAPPA-2010. It also is the winner of the Parenting/Family Category in the International Book Awards 2010. 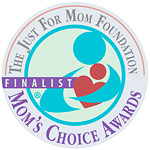 This Web site is a previous Three Star Award winner from The ABC’s of Parenting.